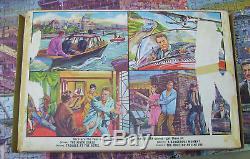 A vintage 1960's British TV show jigsaw puzzle from the show Danger Man (Secret Agent in the US) starring. One from a series of 4 puzzles made by Tower Press (c) Television Products Limited. This one is titled "The Rooftop Adventure". 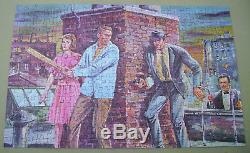 A 320 piece diecut card puzzle which is complete and in good condition. In its original box, the front of the box has "complete" written in ink to the top right corner, the back of the box and end flaps has areas of damage where the surface has torn off. Please see all 5 photos. 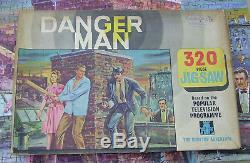 The item "1960's TV show Danger Man Secret Agent Patrick McGoohan Jigsaw Puzzle" is in sale since Saturday, May 19, 2018. This item is in the category "Entertainment Memorabilia\Television Memorabilia\Merchandise & Promotional\Other TV Show Merchandise". The seller is "peterdonpgte" and is located in Newark. This item can be shipped worldwide.